“Be careful what you wish for”, states an old saying. That’s probably because we have a habit of not preparing for what we wish for, but this is just my opinion. After taking a good look at the event management scene I observed that #eventprofs tend to wish some things more than others. Of course, every event is unique, but there are some frequent desires that you can’t overlook. One of these wishes is to create a meaningful event that will enrich the lives of those taking part. Another desire is that people actually take part in the events, and it’s perfectly normal; you want people to enjoy something that involved commitment and hard work (this is why we wanted to help and published an article about how you can use Snapchat and Instagram to promote your event). The question that inspired this piece is “are there ever too many people at an event?” (and I wasn’t considering political or religious events). Then I started documenting sports and entertainment events where the crowds exceeded expectations. There are many events that gathered enormous crowds and unfortunately not all of there are “happy-ending stories”. Today I want to share with you 5 of them that caught my attention (I really can’t tell why these ones and not others, and I hope you will find these cases as interesting as I did). 1994, Rio de Janeiro. Officials from Rio wanted a big event that would help tourism re-flourish. Rod Stewart’s new year’s eve concert and the midnight fireworks gathered over 4.000.000 people on the famous Copacabana Beach (according to Guinness World Records; others say that there were about 3.500.000 people on the beach, but it’s hard to have an exact number in these circumstances). Just think that Croatia ( a Central European country) has a little over 4.000.000 citizens and you will truly understand the size of that crowd. I think it’s safe to say that the crowd exceeded the organizer’s expectations. 1988, East Berlin. It seems that only half of the nearly 300.000 people that gathered for Bruce Springsteen’s concert actually bought a ticket. Millions watched it on public television. Authorities understood that it was almost impossible to stop over a quarter of a million people that were storming the gates so everyone had the chance to see the live performance (ticket or no ticket). There’s a myth that every east-german between the ages of 18 and 45 saw the concert – live or on TV. What would you have done in a similar situation? 1950, Rio de Janeiro. 173,850 spectators paid to see Brazil against Uruguay in the World Cup’s Final, but rumors are that almost 210.000 people crammed into Maracana on that day of July. It was the first World Cup event after 1938 (the Second World War canceled the 1942 and 1946 editions). Everyone was so sure that Brazil will win that they even composed a new song…”Brasil Os Vencedores” (Brazil the Winner), ready to be played right after the final whistle. Brazil lost 2-1 that day and that great crowd was reduced to silence. Alcides Ghiggia, the scorer of Uruguay’s winning goal, once said: “Only three people silenced Maracana: the Pope, Frank Sinatra and me”. 1979, Great Britain. The Knebworth Festival brought Led Zeppelin back in England after 4 years and also brought a large number of people to the venue situated near the village of Knebworth. There was a dispute about the number of attendees and the two involved parties came out with two different opinions: 104.000 (tickets sold) vs over 200.000 (attendees). This is how I found out that at a concert an acre accommodates about 3000 people (a useful information for someone involved in the event management business). Today an RFID wristband would count every single attendee while you take a nap. 2013, Russia. Rock on Volga festival gathered almost 700.000 in 2013 when the German band Rammstein was the main headliner. Known as one of the largest one-day festivals in the world, Rock on Volga stunned everyone by (almost) doubling its size from one year to another. A rise in attendance numbers was expected but the crowd gathered to see Rammstein was beyond anyone’s imagination (I noticed that Russians tend to enjoy rock concerts more than others, there are a few concerts that gathered really spectacular crowds). The world changes, and although technology makes it easier for us manage big events, it’s becoming harder and harder to gather such large crowds (although not impossible). There is a little bit of romance in this stories, but there are also many security issues. Unfortunate history taught us that accidents may occur and that large crowds are hard to manage so if you are planning a big event, learn from the past and prepare for the unexpected. Great crowds are a bliss, but you have to be ready to manage them. For almost one year now, it’s been quite a war between Snapchat and Instagram – Why? Well, on 2nd of August 2016 Instagram has launched the Instagram Stories, which are the identical copy of Snapchat Stories. For those of you who don’t know what Snapchat does, here is a brief intro; a Snap is a picture or video you send through the app to one or more of your friends. It will disappear after a maximum of 10 seconds and can only pe played twice. You have the option to add multiple photos and videos as well into the “My Story” feed which will disappear after 24 hours and can be viewed undefined times; visible to your friends only if you have a private account or by everybody if you have a public account. Instagram did not stop here, and one year later it hits again by copying Snapchat’s crowd-sourcing photos which allows users to send photos or videos from a specific location or event. Basically they can add photos from their personal story to nearby locations. Afterwards Instagram will curate the photos and the selected one that would show in the Explore tab as another story, let’s say New York (story). These stories created through crowdsourcing photos and videos can be searched after the location and hashtag. Learn more how to use crowd-sourcing photos for your next event. Crowdsourcing photos and Geofilters are two of the features that made Snapchat famous among all types of events; managing to create a high level of awareness within numerous events by collecting loads and loads of photos/ videos from all kind of participants at the events. It is an easy and friendly way to promote and bring awareness of your event . Learn more about how to promote your event through Snapchat. 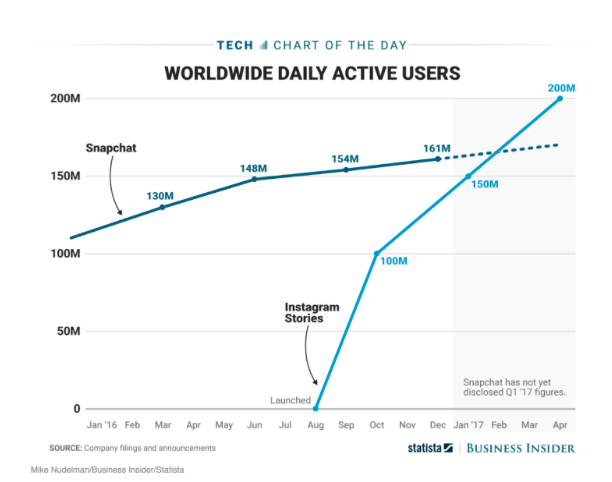 It was quite a significant hit for Snapchat when Instagram launched its “stories ” because they suffered a substantially daily users decrease. In only 25 weeks since launch, Instagram Stories reached 150 million daily users. That’s the same number of users that Snapchat’s whole app reportedly reached in June 2016, after seeing a significant growth from 110 million daily users in December 2015, Bloomberg reported. Another report on TechCrunch found that both Snapchat views and posting of stories counts decreased by 15-40 percent after Instagram Stories launched. Influencers have also noticed that the engagement rates are 3-5x higher on Instagram than on Snapchat. No matter how faithful you are to Snapchat, you’ve got to do what’s best for your business. In order to fight Instagram, Snapchat launched Custom Stories in May 2017. Custom Stories is similar to the normal story posting, the only difference is that it allows users to create their own events within their chosen friends. So for example, if you are organizing a birthday party, you can create a story named “`Birthday Party” and invite only the friends you would like to post in that story. Through Custom Stories, Snapchat is trying to focus more on offering a qualitative and tailored content to their users. Creating the Customs Stories seems to be the logical step after creating a tool that creates on-demand geofilters on the web, in February 2017, which allows users to create custom stickers for different occasions and events. And as competition with Instagram intensifies, it might represent an important milestone in the process of roping in new users. Both Snapchat and Instagram are trying to bring people together through their stories. Even if it is about user’s lifestyle, a private event, a concert or a championship they help people spread the word and their experiences. 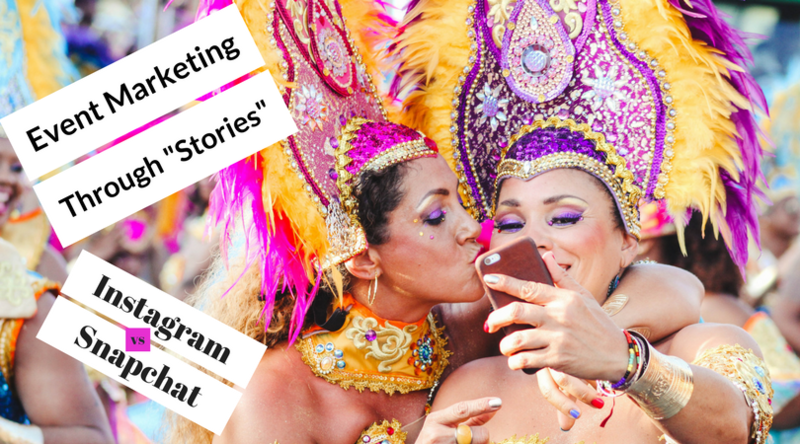 What makes the difference between the two, especially when using Instagram and Snapchat Stories to market an event? It only depends on what are your goals, who is your target and what kind of event are you are trying to market in order to decide if Instagram or Snapchat is more suitable for your event. Having so many users, Instagram’s best use is to bring awareness and gain new potential attendees. But if you want to create an after event marketing, you can make sure that Snapchat is the right tool for you; Leaving all the content to be created by the community, with the wonderful slew of tools that Snapchat has to offer. We are curious and looking forward to see how this battle is going to end. If Snapchat will raise back by increasing the number of daily users; if Instagram will manage to surpass Snapchat in it’s quality and number of features or why not live happily ever after by figuring a middle way to survive on the “stories market” by bringing different added value for their users. Why use RFID and NFC technology within an event? Because it is simple, new and fun. Weather you are a marketing agency or an event organizer you will always try your best in order to succeed organizing “the perfect event”. How do you ensure high-octane experiences within your participants and the overall experience? No matter of what kind of event you are hosting, technology is playing an essential role in order to maximize your consumer’s engagement. The Near Field Communication (NFC) ushered in a new age of technology. This particular innovation, brings an added value to the traditional concept of events, representing the key solution in creating wired experiences. NFC can be used via smartphones and other enabled badges and devices, with amazing benefits for both event hosts and attendees. Basically, it’s a small chip that allows 2 devices to talk to each other when they’re in close proximity. What does NFC actually do? Imagine you are attending an event. You booked your ticket online, registered and linked your social media profile to your registration. When reaching the event you will be handed out a NFC wristband which will offer you instant access, connections, memories and chances to win sweepstakes. Ticket, wallet and, why not, phone free! At the end of the event you can access your own memory bank where all your journey is stored. From photos, music playlists, food you’ve liked and many others. Integrating RFID and NFC technology within events is a simple process when using Oveit and can have a significant impact. Knowing who your attendees are and what kind of interaction they are seeking is the most important thing that an event planner has to know. Once you know that, the rest is done by Oveit ! If you plan on organizing a big concert, in order for it to be an unforgettable event, you will need, of course, great music. But, besides this, you still need to pay attention to a few very important aspects. Take a look at some of the things you need to manage prior to your big night. If you want people to enjoy your concert, make sure the access to your event is simple and they don’t have to wait more than a few minutes to enter the location. 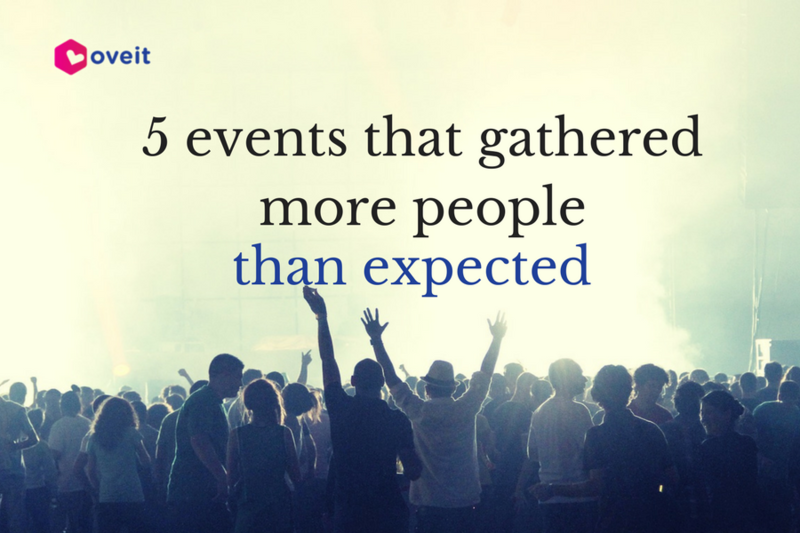 Choose a simple ticketing tool, such as Oveit, that allows event organizers to manage events, registration data, customer relationship and cash flow. Oveit runs embedded on your website and implementation is as easy as copy and paste. Before the concert, you need some smart activities available for the guests, so they do not get bored. If you have sponsors, this task is an easy one – they can make some nice activations for the participants. If not, choose simple, yet effective methods. You can make a real life size cut-out with the band, where people can take photos to post on social media, or have a cocktail bar, with drinks inspired from the songs from your new album. Make sure people have enough choices of foods and drinks at the location. Remember, they have to be able to eat this quickly and without getting their hands too dirty, so you can have sandwiches, popcorn, sweets and beverages. A good idea is to give them something free, like a bottle of cold water, if your concert is on a summer day, or a hot tea, if it’s winter. During the concert, don’t just stand there and sing. Of course, people are there for your music, but involving them in the concert is always a good idea. For example, give them LED wristbands that contain light – emitting diodes and radio frequency receivers. The lights inside the wristband can be controlled by a software program, which sends signals to the wristband, instructing it to light up or blink, for example. Don’t tell your guests what the wristbands really are – you can just tell them that it’s their ticket to the concert. Then, during the show, at a very special song, you can turn them on, creating a very special and unforgettable atmosphere. If you plan on singing more than one hour and a half, consider taking a break. This is good not only for you, but also for your public, because it allows them to get extra drinks and snacks, smoking a cigarette or using the toilet, without missing your performance. Nevertheless, you can sell CDs and merchandise during breaks. Usually, after the show, the band and the staff celebrate the success of the concert, right at the location, most of the times backstage. You can create a special type of tickets, such as VIP or Special Pass, which cost more than the regular ones, but have certain benefits, such as access to the after party organized by the band. You can offer them a glass of champagne and the great opportunity of talking to you, taking pictures of you and spending half an hour with you. So you have a band, lots of talent and good songs, but no money for promoting your work. Getting a signed contract with a label company will probably take care of promotion, but until then, let’s find out what can you do by yourself, using only Internet, friends and networking. At first, all you need is an official Facebook page. Do not waste your time creating accounts on all social media platforms or creating your own website yet. Spreading your efforts too thin may hurt rather than help. After all Facebook is big and growing bigger. There are over 1.6 billion Facebook users. Think you can find some fans there? We sure do. Keep your Facebook page updated with relevant content: photos of you rehearsing, new concerts, new songs, updates about you. Oh, and very important: double-check your spelling and grammar. You want to be a role model for your fans. Keep it classy. Your image is very important. Maybe you have a friend that takes great photos. She can help you with a professional photo shooting. If not, it’s a good idea to raise some money and go to a professional for some cool shots of you. But stay fresh. Post selfies, inspiring images and things happening in your day-to-day life, even if you post them from your smartphone. Record short videos and stream your shows live. 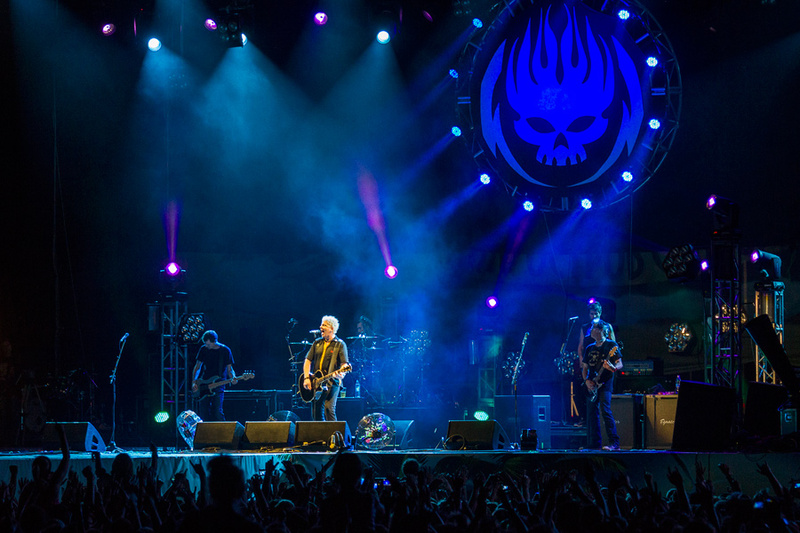 The Offspring in concert. Photo source. The Offspring got started in 1984 with guitarist/vocalist Bryan “Dexter” Holland and bassist Greg Kriesel playing music together in a garage in California. Create an official channel of your band on YouTube and upload quality content or stream live events. You can also post covers, but make sure they sound really good. You want to attract subscribers and fans. Another good idea is to make covers of popular songs – this way, people who search the original song will also find your version and maybe enjoy your personal style. In the description of the video, you can also post the dates of your band’s concerts, if you already have any, or your Facebook page. Socialize. That’s how you meet the right people (and unfortunately some of the wrong ones but never mind that). Maybe no one knows you yet and you do not receive invitations to fancy events, where all the VIPs are. For start, it’s important to attend small events – company parties, birthday parties, small parties in the city. If you don’t know anyone there, even better. Make friends and spread the word about your music. Who knows when you’ll meet the manager of a label company? Maybe you have some friends that also have a band. Why don’t you make a song together? You are definitely familiar with all those popular featurings that big artists make. Well, they have a pretty good reason for it: the number of fans listening is double! This way, the other band’s fans may become your new fans! It’s hard to reach mainstream music press when you are at the beginning of your career, but why don’t you try reaching music blogs? The bloggers are almost always eager to listen to new music and, if they like it, they can promote it on their websites. All artists create for their fans. Now it’s time to meet them. You don’t have to be an already popular artist to sing in front of an audience. First step: make a list of pubs and bars in your city that host local bands, then call them and make an appointment for an audition. Do your best to impress them and negotiate a good deal. At first, you will sing for free, but don’t worry – this is your chance for people to get to know you and start enjoying your music. After this … sky is the limit. Start small and grow from there. Using Oveit you can set up your concerts and receive payments for tickets instantly. Pretty cool, right? As you can see, there a lot of ways to promote your music without a label company of even money. All you have to do is stay positive, be creative and work hard. And, nonetheless, keep on making great music, until you get where you want to be!